The R-Engine (RE) is a high performance, low cost, C/C++ programmable controller, and the first TERN controller based on either the Am186ER CPU (RE40, 40 MHz, 16-bit CPU, AMD), or the similar R1100 CPU (RE80, 80 Mhz, 16-bit CPU, RDC). It is intended for industrial process control and high-speed data acquisition, and especially ideal for OEM applications. The RE40 has 32KB internal RAM, which fulfills many embedded OEM product SRAM requirement. No external SRAM would be required for an OEM version of the RE86. This increase system reliability, decrease power consumption and cost. The RE features fast execution times through 16-bit ACTF Flash (256 KW) and battery-backed SRAM (256 KW); it also includes 3 timers, PWMs, 32 PIOs, 24 PPIs, 512-byte serial EEPROM, an internal UART, a sync serial port, 3 timer/counters, and a watchdog timer. The three 16-bit timers can be used to count or time external events, up to 10 MHz, or to generate non-repetitive or variable-duty-cycle waveforms as PWM outputs. The 32 PIO pins from the Am186ER are multifunctional and user programmable. The receivers are quadruple buffered to minimize the potential of receiver overrun or to reduce interrupt overhead. The UARTs incorporate 9-bit mode for multi-processor communications. Each UART also offer 7 TTL inputs and 8 TTL outputs. 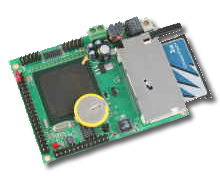 The PPI (82C55) provides an additional 24 user programmable bi-directional I/Os. The 16-bit ADC (ADS8344) has 8 channels of analog inputs with single ended 0-5V input range, supporting a sample rate of up to 20 KHz. The DAC (DAC7612) supports two channels of 12-bit, 0-4.095V analog voltage outputs capable of sinking or sourcing 5 mA. A high speed parallel ADC (AD7852, 300KHz, 8 ch., 12-bit, 0-5V), and a parallel DAC (DA7625, 5 ms, 4 ch, 12-bit, 0-2.5V) can be installed. 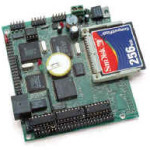 Similar controllers include the R-Engine-A, which adds more ADC/DACs as well as a CompactFlash adapter. The R-Drive adds even more, including solenoid drivers as well as an Ethernet adapter.